Venture Lab The Venture Lab is IE's startup incubator, which is designed for students and alumni to explore market opportunities, incubate ideas and accelerate business. The Venture Lab serves to train and mentor teams to explore, validate and develop ready-to-launch startup ventures. The aim of the Venture Lab is to aid teams in creating ready-to-launch startup projects. It gives teams hands-on experience in the world of high impact entrepreneurship. This means that their ideas have been thoroughly developed to the point where there is validation data (metrics) that shows customer interest, user engagement, and revenue potential from future clients. IE’s Venture Lab is a program that is open to all IE students and alumni. It is also an elective within the International MBA program. The ultimate aim is to complete the program with a short list of fully engaged users of your product/service. The entire focus of the Venture Lab is market validation and obtaining enough data to be ready to move from Pre-Launch activities to Launch. Success in entrepreneurship lies not only in the value of the idea but even more so in the execution of that idea. A successful Venture Lab experience is not necessarily the launch of a company but one in which each team completes the program at best with a business idea developed sufficiently to be prepared to launch and at a minimum with an understanding of what is truly required to launch a startup. You can expect your original idea to morph, change, and evolve over the duration of the program – which is also a key aspect of the entrepreneurial process. Validating a market opportunity is about trying to get the right product-market fit, offering a solution that people not only want but for which they are willing to pay. Ultimately, the goal of the Venture Lab is to prove that your idea is more than an idea and that through Manual Simulation, short of charging customers for the product or service, you can show that the idea has real traction. Individuals can only participate in one Venture Lab application, i.e. individuals can neither submit more than one startup-idea application (as team leader), nor can they be team members on more than one Venture Lab application. INNOVATION – We seek applications from dynamic teams who put forth innovative (novel, extraordinary, revolutionary) ideas, solutions and business models; preferably those that incorporate emerging technologies into their solutions (products/services) and/or business models. SCALABILITY – We seek applications from innovative teams, whose ideas or solutions target hyper-growth markets and are potentially attractive for angel investors and venture capitalists. TEAM – We seek applications from innovative teams who are passionate about solving the problem they’ve identified and absolutely committed to executing a prototype of their scalable solution during Venture Lab. We seek those teams who are eager to complete Venture Lab and graduate so they can launch as soon as 90-days after completing the program. There are two Venture Lab tracks. One is an elective of IE Business School's IMBA program, and the other track is for all IE non-IMBA students and IE alumni. The information below is ONLY for IMBA students from the Sept. '18 intake. Access the IMBA Sept. ’18 Application here. Click here to access the IMBA application. 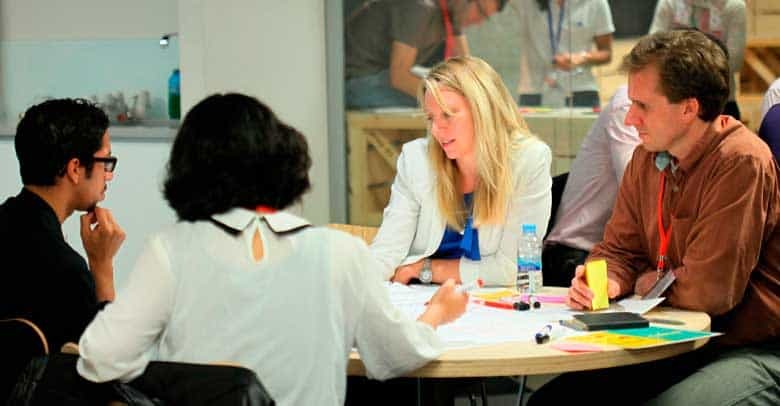 What are the dates for the next Venture Lab Accelerator – IMBA elective? Our next incubator intake (Venture Lab Spring 2019) will begin the week of April 1, 2019 and culminates with Venture Day on July 11, 2019. Deadline for applications from IMBA elective students: March 21st, 2019. The Selection process will consist of Committee Reviews of the applications, based on the Selection Criteria. Acceptance decisions will be announced: March 27th, 2019. The Venture Lab program begins the week of April 1st, 2019. Semi-finals will take place during the week of June 24th, 2019. What are the eligibility requirements to apply to the Venture Lab? Teams must consist of at least 2 team members (seeking elective credit) and no more than 4 team members. (Some exceptions will be made for IMBA teams from the Startup Lab of 5 members, but we highly advise against such large teams at such an early stage). Individuals can only participate in one Venture Lab application, i.e. individuals can neither submit more than one startup-idea application (as team leader), nor can they be team members on more than one Venture Lab application (simultaneously in a single round). What are the selection criteria on which acceptance decisions are based? SCALABILITY – We seek applications for proposals that are scalable and potentially attractive for angel investors and venture capitalists. TEAM – We seek applications from innovative teams who are passionate about solving the problem they’ve identified and absolutely committed to executing a prototype of their scalable solution during Venture Lab and who are committed to working on their projects full-time and turning them into launched startups upon graduation.. In what language are the Venture Lab sessions conducted? Venture Lab sessions are conducted in English. However, IMBA elective teams are permitted to submit deliverables in Spanish. You may also conduct your final pitch in Spanish, but please know that if you are selected to pitch as a finalist or a semi-finalist at Venture Day then those pitches must be in English. I am not enrolled in Startup Lab; can I still apply? Yes, all IMBA students are eligible to apply to participate in Venture Lab. Some students may not be able to receive academic credit (e.g. dual degree students, etc.). Please contact the IMBA office if you have any doubts. Is Venture Lab a continuation of Startup Lab? No, the two programs are completely separate and different. In the SUL you dedicate 5 weeks exclusively to attending classes and working in teams on your startup project. In SUL all business ideas are feasible and anyone who wants to participate is eligible. Every Friday you make a pitch and the momentum is fast and forced! In Venture Lab, the dynamic is radically different. Venture Lab is the only IMBA elective that you must apply and be accepted to participate. We only accept ideas with scalable business models and high-growth markets. Large teams are strongly discouraged. We are seeking the most committed and enthusiastic teams who want to launch after graduation. All other students are encouraged to explore other electives that are designed to continue to guide and support you in your entrepreneurial journey (like the Knowledge Incubator, for example). In Venture Lab, the momentum and drive is designed and expected to come from the teams themselves. While there are academic obligations required for all IMBA teams, the additional resources and support are personalized for each teams. You will get out of the Venture Lab, what YOU put into it. There are no classes per se in the Venture Lab for IMBA teams. You will receive mentoring and access to industry experts as well as the option of participating in one-to-one clinics (Legal; Digital Marketing, Branding & PR; TechTeam Planning; Human Team Dynamics, etc.) as well workshops on topics such as Wireframes & Prototyping your MVP, Dynamic Equity, Productivity & Execution, etc. and you will receive specialized mentoring from early-stage investors in general and related to pitching. Can I fill out the application in Spanish? Yes, applications for Venture Lab can be filled out in either Spanish or English. Is there a minimum and a maximum amount of people who can be on a team? Yes, you must have at least 2 people on a team and you can have a maximum of 4 team members (some exceptions will be made for SUL teams of 5). Can I apply with more than one project/startup idea? No, you may not. Individuals cannot be listed as team members on more than one application. Does IE expect or require any equity in the startups accelerated in Venture Lab? No, absolutely not. We do, however, reserve the right to brag about your success. I’ve heard that only apps are accepted into Venture Lab, is that true? No, this is not true. Venture Lab is aimed at startup ideas that are innovative and scalable. Therefore, we are looking for dynamic ventures that provide scalable solutions to big enough problems/markets that they can grow dramatically and be attractive to investors. Acceptance into IE's Venture Lab is highly selective. We're looking for the most committed and diverse teams, as well as the most innovative ideas and business models. The information below is ONLY for IE Students and Alumni who are not in the IMBA program from the Sept '18 intake. APPLICATION (NOT for IMBA students): We are no longer accepting applications for the current Venture Lab.